We stopped at a tree trunk that had really clear and visible rings. The children counted 36 rings. I told them the tree was the same age as me! The fallen, up rooted trees had puled up lots of soil and chalk from the ground. 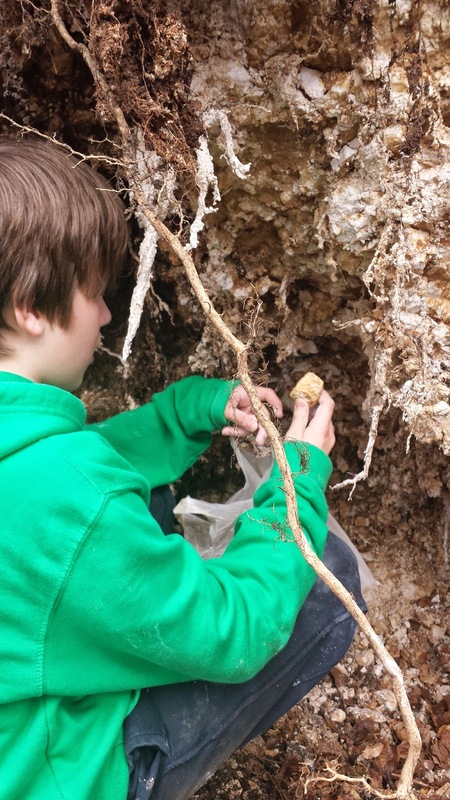 Brendan found this a fantastic place to sit and dig and filled a bag with chalk to bring home. 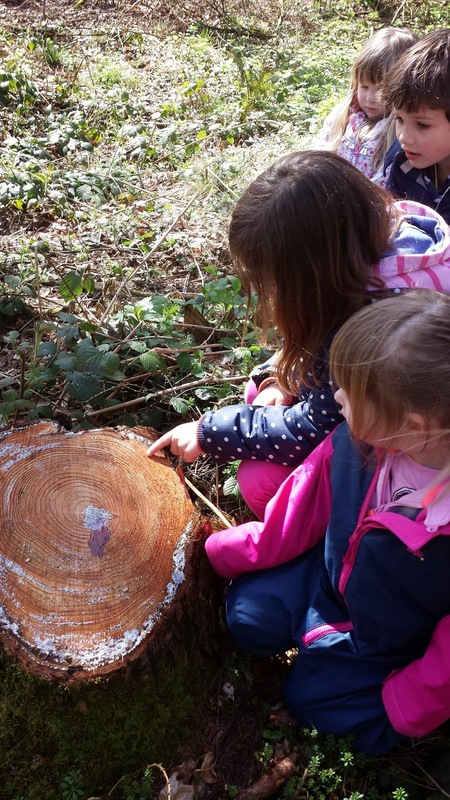 When we reached the “crater” (our name for the best spot in the woods) we noticed that people had made some really fabby dens. This saved some of the hard work for us but also gave the younger children a good base to add to. This is the den in the base of the crater. There is a tree in the middle which makes a great place to rest branches on to build up the den from. This photo look a little odd. Like “R” is a giant…. or “L” is a pixie! In actual fact, “L” is walking up from the crater base and “R” is crouched down looking at a ladybird on a blade of grass! “S” was having lots of fun till she got something in her eye. I felt so sorry for her as I could not seem to make it better and I could not see anything in it. Daddy came to get her early and took her to a friend who is an A&E Dr. She managed to remove a piece of grit which was causing the issue and thankfully the irritation was instantly relieved! Poor thing. 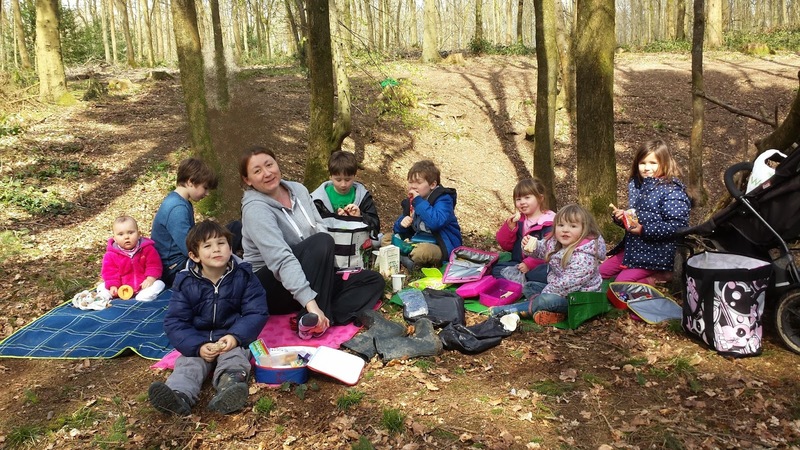 The younger children had a great time in the dens! Some of the children decided to use our bags of den making supplies (tarpaulins, guide ropes and ground sheets from the pound shops!) and attached them to an uprooted tree. Working together and talking through how best to attach the sheets. The little ones spent a very long time climbing out of the steepest side of the crater and then sliding back in to it on their bottoms while calling to each other and giggling! Brendan walked arounf the wods giving trees faces with his newly found chalk! “L” and “R” hadn’t noticed what he was doing but found it very funny when the trees started to have faces!! We gave each child a nappy sack to fill with natural items. “L” gathered mainly leaves in hers and then came to me and poured it all out to show me. She shouted “NO WIND” as the wind blew and some of the leaves started to blow away again! We enjoyed a picnic lunch together. Refuelling for more fun! THOMLEY HALL Batman pancakes and woodwork.